The town of Ulverstone in the southern Lakes is well used to tourists. It has more than the average number of pubs and cafés ready to welcome the influx of summer visitors and walkers. The town is watched over by the clock tower of Barclay’s Bank and even higher by the Lantern House which resembles a lighthouse and is prominently set on a hill to preside over events below. The narrow cobbled high street has all sorts of interesting shops. There is an old fashioned sweet shop to marvel at, its shelves are lined with jars of old-fashioned boiled sweets and every possible chocolate and toffee confection produced in the last few decades. There are shops that do not exist in southern areas; ‘Loopy’, a wool and tapestry shop manages to survive when similar shops have long given way to phone shops and pound shops, Gillam’s of Ulverstone claims to be a purveyor of fine foods and also doubles as a tea shop, there are several additonal tea shops including the Mad Hatter’s Tea Rooms. Ulverstone is a small town that would entertain and amuse visitors for an afternoon or so. Robinsons and Hartley Jam signs on a wall alongside the Brewery Street Car park allude to the presence of barley water and jam manufacture locally. J. N. Murray Pharmacy harks back to a different age; its sign states that health advice was also dispensed over the counter. 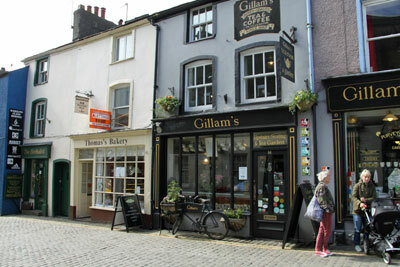 A few small independent clothes shops offer attractive ladies wear and handbags at low prices. It does not take long to realise that the Southern Lakes is not an affluent area and goods in shops are geared to value. For holidaymakers, there is a cinema and several supermarkets just outside the town centre. The public toilets near the cinema require an entry fee (20p in 2014) but one inside there are three cubicles for men and women. If you’re aware of this, an entire walking group can use the conveniences for the one fee.